The stones here speak to me, and I know their mute language. I’m on the dock in Sittwee with my two companions bright and early only to discover we have two hours to wait. The locals are also waiting – swaddled in winter coats and hats. Even though I was already sweating, it was the cool season for them. 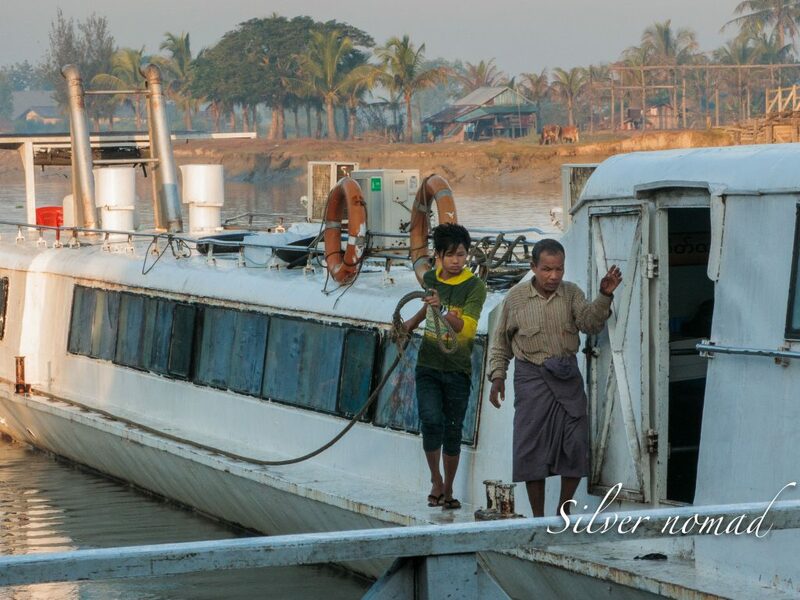 I was really looking forward to the boat trip from Sittwee to Mrauk U. I had visions of hanging out on the deck taking interesting photos of life on the Kaladan River. I should have known better. The boat was long and barge-like sitting low in the water. But at least the narrow gangplank from jetty to boat was relatively easy to navigate with hands clutching me to ensure I didn’t fall in the water. Inside, the seats, three in a row on each side of the central walkway, were so low to the floor that it was impossible to see out of the windows. Even if the seats were higher, it would still have been impossible to see out. The windows were covered with dark blue curtains – to keep out the sunlight – which every self-respecting Myanmar wants to avoid. In any case, the focus of the locals is not on what is happening outside the windows but on what is happening on the screen at the front. I sat as far away from the screen as possible and as close to the door (read escape hatch) as I could manage. I wanted to avoid what I suspected would be the typical Asian movie – very loud and with much grotesque violence. But I need not have worried. The Myanmars are into gentler stuff. The movie seemed to be about a man who couldn’t get his act together to claim the girl of his dreams and so appeared a buffoon – much to the amusement of the rest of the passengers. 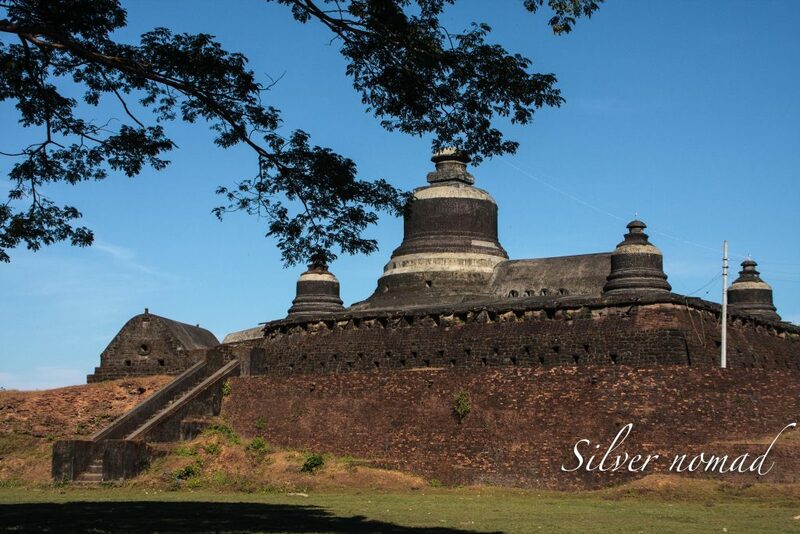 And Mrauk U has been there for a very long time: even Myanmar Tourism describes it as ‘the forgotten kingdom’. 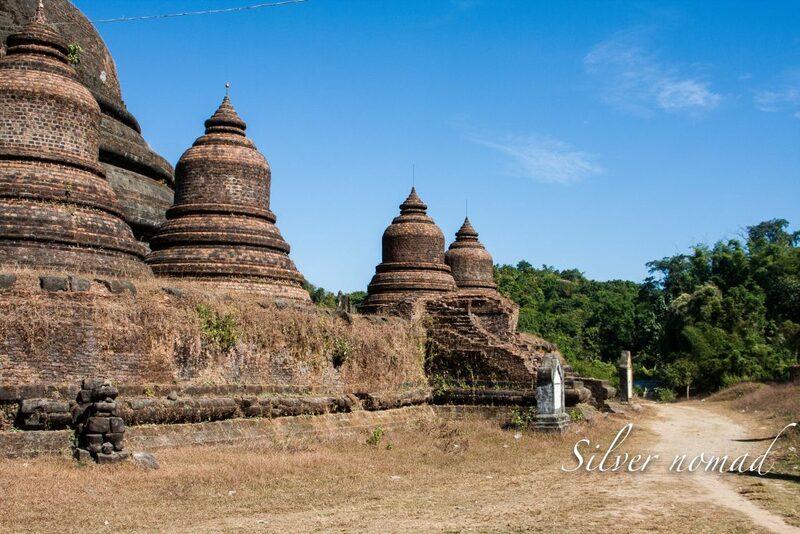 The kingdom of Mrauk U was founded in 1433 by King Min Saw Mon. During the sixteenth and seventeenth centuries, it was a well-known port with ships from Europe and the Far East able to sail seventy kilometres up the Kaladan River from the Bay of Bengal in order to trade. At one stage, the kingdom controlled half of what is now Bangladesh as well as a large portion of Myanmar. As the city grew to 160,000 people, they expressed their gratitude by building temples – many temples. Many of these temples have survived, and while the site is not as large or as imposing as Bagan, it has its own charm. Temples of this bye-gone era litter the landscape and you will need to walk across threshing circles and vegetable gardens to reach some of them. The usual upside-down bell-shaped stupas are much in evidence but many of the buildings use this familiar Buddhist design in unusual ways. The first temple I visited was Shitte-Thaung Pagoda where you pay your archeological zone fee of approximately five dollars. It’s well worth it. Shitte-Thaung was built in 1535 and is reputed to be home to eighty thousand Buddhas. And, no, I did not count them. 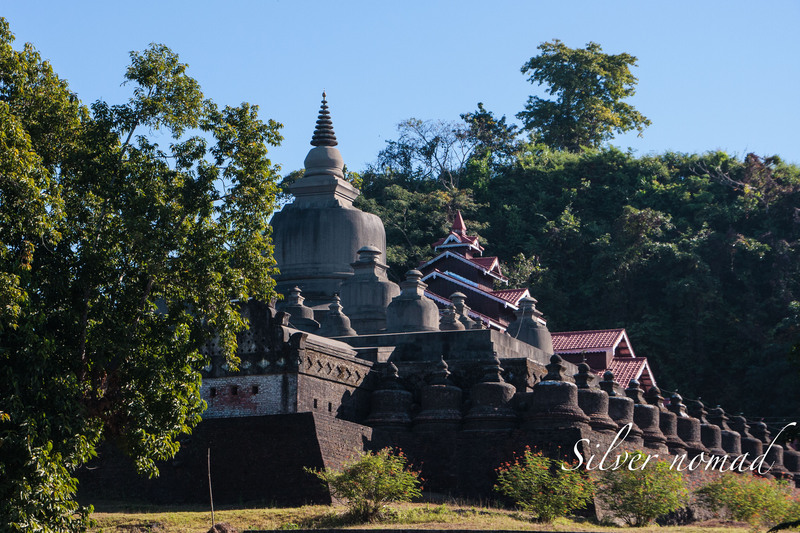 Like many temples at Mrauk U, Shitte-Thaung was built on a hill and looks like a fortress. The temple has a main stupa with four smaller stupas, one in each corner. Inside the temple is a main prayer hall containing many Buddha images. A long dark passageway, said to be one hundred metres long, leads from this room into the inner temple. It contains many sculpted figures depicting ordinary Rakhine people as well as scenes from the Jakarta tales (stories of the Buddha’s life). There are also scenes of Hindu deities including Indra on three elephants. At the centre of the temple is the room that contains Shitte-Thaung’s principal Buddha – three metres high and made of gold. Close to Shitte-Thaung is Htukkenthein temple built in 1571 and looking like a bunker. It is very dark inside and a very long corridor spirals to an inner chamber. I felt like I was circling the innards of an ammonite. There are 140 arched recesses in the walls, each enshrining a stone image of the Buddha. Surrounding the Buddhas are sculpted figures of ordinary people said to have sponsored the construction of the temple. The passageway ends in a five metre high inner chamber shaped like a dome. Daylight from above illuminates the Buddha figure. 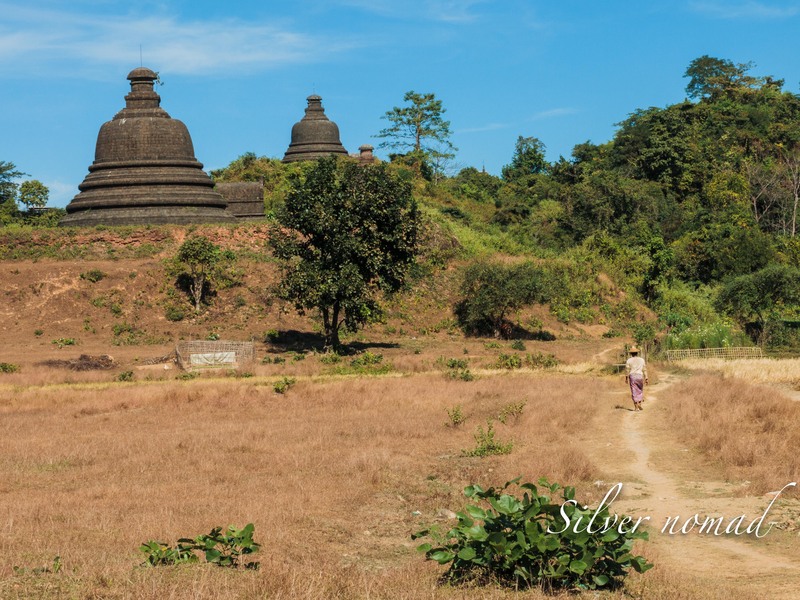 Many of the temples are well within walking distance of each other but I wanted to see Koe-Thaung, the largest temple in Mrauk U.
Koe-Thaung lies a couple of kilometres from the village so I hired a horse and cart to take me there. It was a rough ride over roadways that were substantially more rock than anything else. 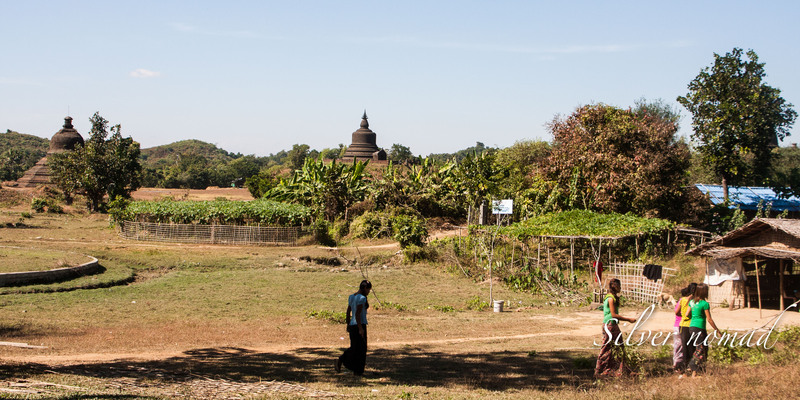 But temples aren’t the only attraction to Mrauk U. 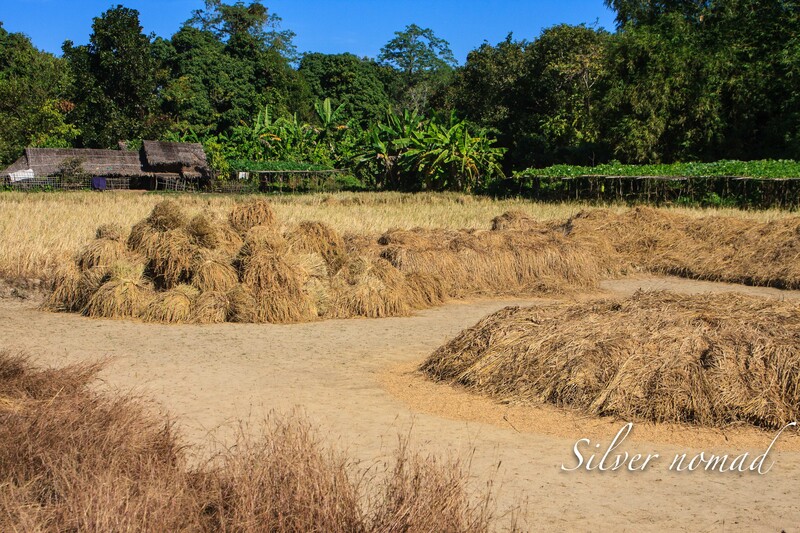 The village itself presents a kaleidoscope of ordinary people going about their daily chores. 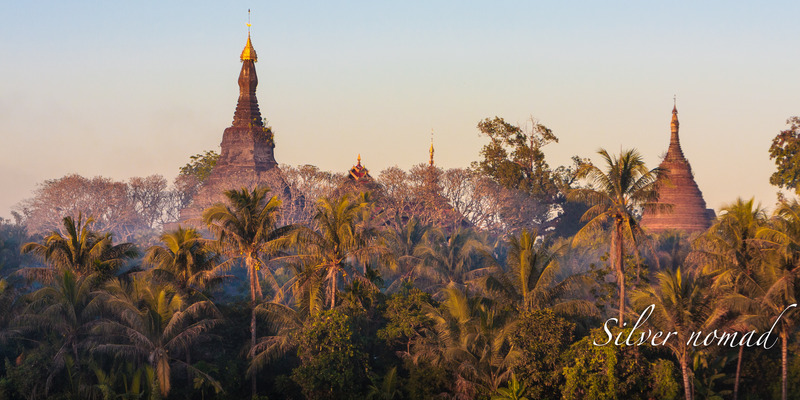 You don’t need to see the friezes in the temples – you can watch rural Myanmar unfold before your eyes. A family cooking their evening meal in the lane outside their house, an old woman curled up on a bench at the end of her garden watching the world go by, a woman drawing water from a well – all are indelible scenes. And all around the village, frequently interspersed with the temples, you can see farmers taking care of their crops. And then there is the market. It’s very busy – full of life and colour – as people from the surrounding rural areas come to the big smoke of Mrauk U to do their shopping. There was plenty to keep me busy in Mrauk U but I could not leave the Rakhine State of Myanmar until I had seen the Chin ladies. The Chin tribe, one of Myanmar’s ethnic minorities, used to tattoo the faces of young girls as a sign of beauty. When I visited Mrauk U in December 2014, only seven of these ladies were still living. I had to see them. And this involved a trip in another boat.